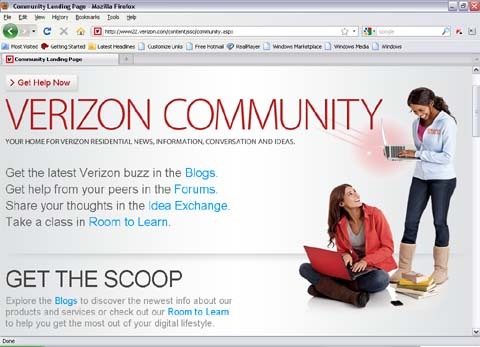 Verizon’s active online community deflects support calls, saving the company millions each year in traditional customer support costs. Today, big businesses are saving millions in traditional sales and support costs by using virtual agents and building massive online support communities. But they are also finding just as much success in using their blogs, peer-to-peer forums and even Twitter to deflect support calls. And that’s good news for small businesses. Today’s customer expects to find answers online. As a result, more and more companies are investing in online customer support options. Well managed online support should be a place where customers can post questions and find answers 24/7 – without having to wait on hold for a customer service agent. The best case scenario for a business is when that support becomes peer-to-peer. In other words, when customers start helping other customers with support and buying questions. When customers can help other customers, that saves you time. For ideas on how you can encourage customers to chat about your business, along with case studies on what other top companies are doing online, check out the 3rd Edition of Low budget Online Marketing for Small Business. Building a peer-to-peer support community is exactly what Best Buy did. With the help of some employee oversight to ensure the answers were correct, Best Buy created an online community where customers could share stories and help each other with their recent technology purchases. In addition to the decrease in support calls, they saw an 18% decrease in overall customer complaints. Customers enjoyed being able to quickly search and find answers to common questions without having to pick up the phone. In 2009, 2.5 million people visited the forums making 79,000 posts and 95% of those posts were handled by another customer! What’s more, of those customer interactions, 30% of the conversations involved only 12 “super users”. And this is not uncommon. Typically every community has a small percentage (around 1%) of creators or “super users” doing most of the posting. These are the users who help build loyalty and drive the voice of the community (or in the case of Best Buy, help to answer the most tech support questions). About 10% of your community audience will be “editors”. These are people who will contribute a comment or two, but rarely start their own post from scratch. And finally, 90% of your audience falls into the category of spectators or “lurkers”. This means that they are merely observing most of the time, and rarely actually post. 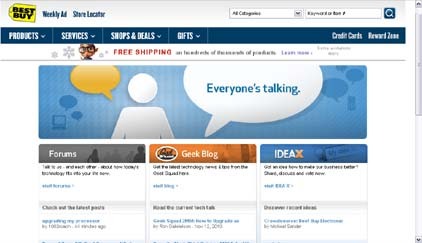 In 2009, 2.5 million people visited the Best Buy forums. 95% of those posts were handled by another customer! What does this break down of online users mean for your business? It means that if your product warrants enough support chatter, the key to making an online support system work for you is to identify and then provide incentives your most passionate customers who are most likely to contribute to the online conversation (super-users). Providing incentives does not mean give money. In fact, once you give customers payment for chatting about your business online they are no longer genuine ‘super users’. However you must make them feel appreciate and special so they continue to contribute. Are you already using online communities to promote your business? Great! Share your comments and advice here. This entry was tagged best buy, best buy community, bloggers, case studies in social media marketing, customer bloggers, low budget online marketing for small business, marketing business, online communitys, online customer support, online marketing, peer to peer support, social marketing, social media, super users, verizon, verizon community, virtual agents. Bookmark the permalink. What I like about this post is that it starts to quantify the cost benefits of using social media for customer support. 79,000 posts or questions and 95% were answered by other customers. That is phenomenal. I spoke to the digital manager at British Gas recently and they use social media monitoring technology to listen to negative comments anywhere online in public spaces and they respond via conversational media to fix the problems. For example; Mrs Jones in Manchester Tweets that her gas boiler has broken and that British Gas have been rubbish at helping her. The support centre picks up the negative blog or forum post or Tweet and they Tweet or blog back as appropriate to solve the problem. It is definitely the way forward but what I wonder is that as more and more businesses start leveraging social media for mass business process functionality then can the social platforms and their servers support and afford that weight of traffic under their current advertising model? IT directors will have to go into those situations fully aware of any ongoing costs. You don’t want someone from Facebook calling you with the ultimatum of a bill you didn’t expect if 10,000,000 of your customers use the platform to do business with you. If the systems can sustain the weight of traffic at the same low cost as today then businesses are about to save a fortune through social CRM.
) to monitor anytime someone talks about their products online. These social media monitoring tools work with keywords but go beyond a simple Google Alert (http://www.google.com/alerts) by providing you access to a dashboard where you can easily see what customers may be saying about your company on all the social networks in one place. They also allow you to quickly respond to those comments, or forward them to someone in your company who is better at addressing the customer questions/problem. In one spot, you can track what is being said and how people in your company have responded. I am seeing more and more low cost options show up that small businesses can use…do a quick Google search for “social media monitoring tools” to find the one that’s right for you. Even the smallest of companies can have a social media strategy that doesn’t cost the world. Ask yourself who your target clients are and then demographically profile them. Then ask them what their top three topics of conversation are and plug those into a free monitoring tools like netvibes.com obviously if you can afford the others mentioned above go for it. This will allow you to listen to what they are saying and where. Once you have done this target the relevant media – put the influential individuals, sites and companies with their details onto a spreadsheet. The next thing to do is to come up with relevant content that facilitates you having value add conversations on those sites with those people and put it on your blog. That will allow you to reference useful information on your site and get involved in the conversation with your target audience. Remember to always add value. These are just some thoughts. I hope they help. FYI the way I found this blog was through Google Alerts under ‘Online Communities’ blog results. A free listening tool! We also have Sentiment Metrics (like Radian 6) but I didn’t find you through that. So don’t forget the free tools! Thanks for the tip about NetVibes.com — I tried it out and it was so easy to get started. You don’t even have to register or sign up for anything. You enter a keyword (company name) and you instantly can see what people are saying about it on blogs. I already jumped in and replied to some of the posts. Its invaluable!